Last November, I underlined major stylistic differences between English and French. Here are a few more. Do not lowercase French articles (e.g., La Presse, not la Presse). Do not combine French articles with English ones. For instance, do not write, “The news came after the La Presse news outlet reported allegations of abuse from young boys who are now adults.”1 Consider rewording: “The news came after La Presse reported … ” Note that the generic news outlet has been removed in the edit, and the newspaper title has been italicized. Phrasal verbs are more idiomatic and improve overall readability. Consider using phrasal verbs when working into English or editing English translations. This is not to say, however, that Latinate verbs should be eliminated altogether: they have their place in some contexts. Le chef d’équipe distribuera les documents aux agents de recenseurs la semaine prochaine. La firme architecturale vérifie les plans et formule des recommandations d’ici la fin du mois. The supervisor will distribute documents to enumerators next week. The architectural firm will verify blueprints and will make recommendations by month’s end. The supervisor will hand out documents to enumerators next week. The architectural firm will go over blueprints and will make recommendations by month’s end. 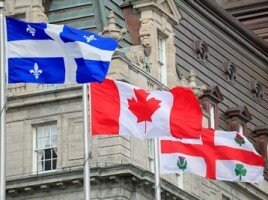 Previous “English Editing in Quebec” post: Avoiding Wordiness. 1 What follows reported is fictitious; I could not find the actual excerpt where “The news came after … ” was first mentioned. Context: In February 2016, we learned that Claude Jutra, the late Canadian actor, film director and writer, was at the centre of sexual abuse allegations in a book written by the journalist Yves Lever. 2 Sandra Thibeaudeau, Guide de la communication écrite en anglais, Québec Amérique, 2012, p. 230. One Response to "English Editing in Quebec: All About Style (Part Two)"
Another helpful reminder, Dwain, thank you!